So, I self-diagnosed myself this week, which is always at least a bit dangerous. About two weeks ago I began to get some discomfort on the side of my left foot. After a couple of runs, that discomfort had turned into “hurts to walk” pain. Icing and ibuprofen helped, but the underlying pain seemed to be getting worse. The wonders of Google and, voila!, I all of a sudden am suffering from peroneal tendonitis. 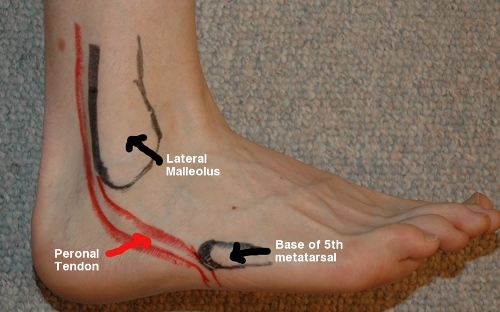 The pain is located right at the point where the peroneal tendon attaches to the base of the 5th metatarsal on that picture – basically where the bone and tendon meet. This injury is described as an overuse injury, and coming out of this horrible winter that makes sense. And I have a half marathon in like 6 weeks. So I took a zero this week. I hate taking zeros, but the last thing I need right now is to be hobbling around lame just as the weather is getting perfect for running. Long-term, that’s the right choice … even if short-term it was awful. And this morning I went for a run, my first since the JFK Runway Run. Just a little short run, getting my legs back under me … but it went well, and I’m not struggling to walk. Tonight I will ice and elevate, and tomorrow I’ll try it again.